Single door folding crate includes adjustable divider panel and pan. Fits toy breed size dogs. Crate is 22 inches long X 13 inches wide X 16 inches high. Life Stages Double Door Pet Home with ABS plastic pan and divider panel. Easily sets up and folds down to portable size. Crate size is for dogs weighing 11-25 pounds. Your dog should be able to stand up and turn around comfortably. The only Pet Crate with a Double Door for added convenience for the pet owner. The second door gives unlimited access to your pet as well as superior ventilation while in the crate. Our pet crates come with molded in handle for ease of carrying, Secure fasteners, Cargo hold downs for secure travel, Wire doors and vents for pet comfort, Spring Latch door for added security for your pet. Designed to meet IATA requirements for shipping live animals. This Extra Large size is 41 x 27 x 30. 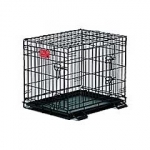 Fold and carry wire dog crate with free divider panel. Divider panel allows the length of the living area to be adjusted as the puppy grows into the adult size home. Durable, black electro-coat finish. Easy to clean and comes with an ABS plastic pan. Versatile design allows for side and front door access. Includes free divider panel which allows the length of the living area to be adjusted as the puppy grows into the adult size home. Fold and carry for easy storage. Black electro-coat finish.